Hanna is a teenage girl. Uniquely, she has the strength, the stamina, and the smarts of a soldier; these come from being raised by her father, an ex-CIA man, in the wilds of Finland. Living a life unlike any other teenager, her upbringing and training have been one and the same, all geared to making her the perfect assassin. The turning point in her adolescence is a sharp one; sent into the world by her father on a mission, Hanna journeys stealthily across Europe while eluding agents dispatched after her by a ruthless intelligence operative with secrets of her own. 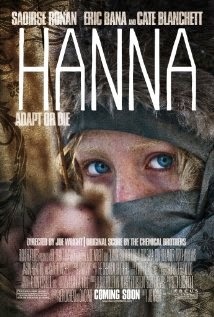 As she nears her ultimate target, Hanna faces startling revelations about her existence and unexpected questions about her humanity. Marissa, did she turn out as you hoped? I had no idea what to expect from this movie. I’m not the type that reads opinions upfront as a guide. Usually it’s the opposite of what I thought anyway. Hanna, beautifully played by Saoirse Ronan, was trained for years by her father in Finland to perform a task which is to liquidate Marissa Wiegler. This cold lady was the one who killed her mother because she had to make sure that there were no witnesses anymore of a secret experiment with DNA. An experiment in order to grow a superior human being. A kind of super-soldier. Hana was the last witness. Well, that’s the whole story in a nutshell. I also expected a kind of “Jason Bourne“-like spy thriller with lots of action and suspense. However, it didn’t work out that way. Yet this was a gem of a movie. Why? Because it’s all shown, filmed and told in a different way like most action-espionage thrillers. The opening scenes in the bleak landscape of Finland were sublime. From there the movie attracted my attention and didn’t let go. The images of the desert and Morocco were magnificent and desolate as they should be. The maze of corridors and tunnels in the underground base gave a disorienting feeling. The city of Berlin was shown in such a way you could feel the chaos and obscurity of that metropolis. The whole film has an art deco, experimental and surreal tint. At times I thought it was a complete freak-show and a split second later I thought it was brilliant. The character Hanna is sophisticated. A fragile girl that DNA-wise was programmed into a cool effective killing machine. Her cold-blooded accuracy in actions is in contrast with those bright blue eyes that are sometimes shown in close up and shows just how vulnerable she is. Erik (Eric bana) is a former CIA agent and “That’s it”. He shows no emotions or feelings. A focal point in his life and a main goal to perform. Marissa (Cate Blanchett) is a weird twisted plastic figure who brushes her teeth until they bleed. A subtle detail to show that she pursues perfection in everything she does. A tough cookie to kill what is clearly noticeable in the underground base. She always was a step ahead. Knepler (Martin Wuttke) is a weirdo who just crawled from under a mushroom. A clown looking like Catweazle. Isaacs (Tom Hollander) and his two stupid hopping mad skinheads look totally wrong and ridiculous, but still fit into the whole picture. Isaacs in his tracksuit and laughable tennis outfit looks totally ridiculous. And the family in the dessert is a parody of new-age parents with a snobby teenage daughter. Hilarious in a specific way. So it is the overall picture of Kubrick-like surrealistic images, mixed in a dark and obscure “The Chemical Brothers” soundtrack, that made this such an interesting movie. A surreal tale full of symbolism in which the choreography and the camera-moves brings the whole to a higher level. The action scenes were not technical feats, but were not important in the overall scheme of the film. They were pleasant interruptions in this for the rest very arty film. In a must-have collection ! You forgot the beautiful beautiful longshot in the movie.